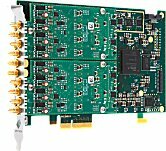 The M2p and M2i card series has our greatest selection of channel and resolution combinations to provide exceptional performance for applications such as radar, telecommunications, ultrasonics and spectroscopy...to name but a few. In fact just about any application that requires ultra high-speed signal capture in the MHz range. A/D converter speeds range from 200K to 200 mega samples per second. Each channels of the M2p / M2i signal capture card is equipped with its own A/D converter, ensuring perfect synchronisation hence zero phase difference between input channels. High channel count, wide gain ranges and in many cases software selectable single ended or differential inputs, adds to the exceptional versatility of the M2p and M2i ranges. Utilizing highly advanced analogue to digital converters, we here provide digitisers with 8 bit resolution, high gain range and sample rates up to 1 giga sample per second. This M3i series of instrumentation cards provide a cost effective method to sample at high speeds. Features include a software enabled 20MHz anti-aliasing filter. Additional connectors provide two bi-directional digital inputs, which can be set as synchronous or asynchronous to the analogue channels through software. Ideal for positional, status monitoring and control. Using a high bandwidth multi-lane PCI Express Gen 2.0 interface (physically PXI Express in the case of M4x series), data streaming to the host computer is greatly enhanced with giga byte transfer capability. This makes the M4i / M4x card series of particular value to users acquiring ultra fast signals over longer periods at mega and even giga sample rates. 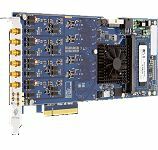 Fitted with high resolution 8 to 16 bit A/D converters and sampling speeds up to 5 giga samples per second, these cards build on the success of the M2i and M3i ranges. The M4i / M4x series also shares the same well proven software driver set, which includes support for all common programming languages and packages such as LabVIEW and MATLAB. Up to eight M4i PCIe cards can be perfectly synchronised to provide up to 32 channels for signal capture. The number of M4x PXIe cards is only limited by the number of available PXIe or PXI hybrid slots in the chassis as all synchronisation performed via the back-plane. Up to 16 fully synchronous channels on one card. Large standard memory, 4 Gbytes on M4i & M4x, 512Mbytes on M3i & M2i, 1 Gbyte on M2p. ABA mode available. Go from slow continuous to rapid acquisition on trigger events. Essential for multiple card installations and any number of the more powerful M3i and M4i series. Spectrum's digitizerNETBOX places the ultra fast instrumentation card technology described on this page into a robust enclosure that can be attached to the Gbit Ethernet port of a computer. Combine with a notebook PC and DC option for portability, or within an extended Ethernet network which may include more digitizerNETBOX units. This unit includes its own Web server which gives the facility to remotely view and configure the setup. It also has its own IP address so that captured data can be streamed back over the network to a client PC. The digitizerNETBOX is very portable and can be taken with the operator, (e.g within a vehicle) using a notebook PC and DC option. For complete independence from a host computer, an embedded server option, with installed CPU, RAM and SSD is also available as an upgrade option. The digitizerNETBOX docking station package includes SBench6 Professional for easy set up, log, view and signal processing. whilst Windows/Linux drivers provide programming in MATLAB™, LabVIEW™, or one of the popular programming languages such as Visual Basic or C. Interested? Click here for more details and a complete list of models! For existing users of the M2i.30xx, 31xx, 40xx and 49xx series cards, who simply wish for a drop-in replacement, we can still supply. Please contact us for further information. For new applications we now recommend the M2p series cards. For existing users of the M3i.32xx, 41xx and 48xx series cards, who simply wish for a drop-in replacement, we can still supply. Please contact us for further information. For new applications we now recommend the M4i.44xx series cards. This card range provides a particularly modular and robust format, most popular in the industrial environment. All are notable by the fact that synchronisation and triggering is neatly connected across a back plane of the mating enclosure. The latest generation of fast data streaming 3U PXI-Express signal capture cards is offered by the M4x range. 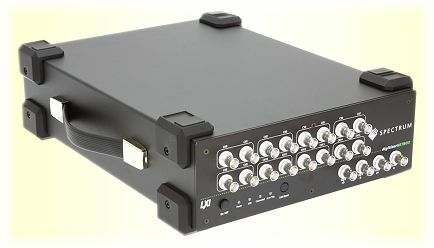 We also have 3U cards in legacy PXI format, with a wide range of A/D sample speeds and resolution.